The first of January marks implementation of the modification to the Rules of Golf banning anchored putting strokes but though many think the anchored stroke with a “belly” or “broomstick” putter is something thought up by players in recent years, it in fact has a long history. In the 1920s future Hall of Famer Leo Diegel came up with what was tagged as “Diegeling,” a stroke with a conventional length putter but with the end of the grip pressed into his navel. 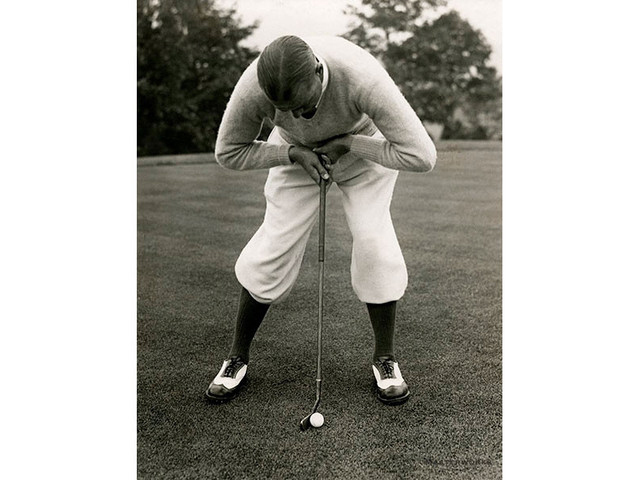 Though anchored putting was not unknown–there’s at least one report of players using an anchored putting stroke from around 1900–the pro from Detroit was the first nationally prominent player to use it in and win professional tournaments. Beginning in 1920 he took home trophies 30 times on Tour including the PGA Championship twice. Diegel had the reputation for being among the best shotmakers of his era and having an intensity that elevated the game to an all-consuming passion combined with a coolness when the competition was the toughest. 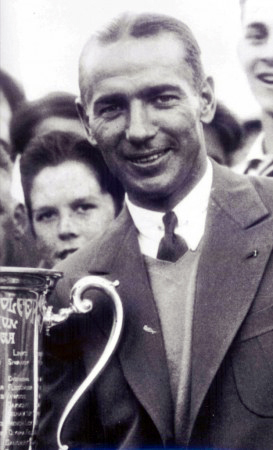 In 1928 on his way to winning his first PGA Championship (then contested at match play) he defeated the great Walter Hagen in the quarter-finals knocking out “the Haig” who had won the previous four PGAs. Then in 1929 before taking care of Johnny Farrell 6 & 4 in the finals, Diegel again beat Hagen in the semi-finals. 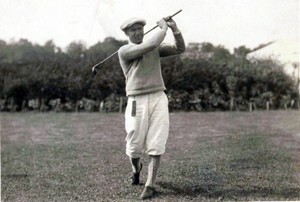 Even early in his career he showed promise tying for second in the 1920 U.S. Open one stroke behind Englishman Ted Ray. Diegel was selected to play for the United States in the first four Ryder Cup squads and won the Canadian Open four times though it was not yet an official event on the PGA Tour. He also played a role in one of the game’s most enduring events by finishing just two shots behind Bobby Jones in the British Open of 1930, the second leg of Jones’ epic Grand Slam. Just to keep it all in perspective with all the attention given to current stars such as Adam Scott and Bernhard Langer, many A-list players have used a belly or broomstick putter at one time or another. Plus fans will remember Charlie Owens winning won twice on the then Senior Tour wielding a 51 inch putter he had tagged “Slim Jim” that he anchored to his chest due at least in part from injuries he received during his service in the U.S. Army as a parachutist. Another outlier with a broomstick in his bag at the time was Orville Moody (“The Sarge”) who won the 1989 U.S. Senior Open. A flood of major winners using anchored strokes was responsible for the 2013 change in Rule 14-1b making them illegal thus relegating bellies and broomsticks to history: 2011 Keegan Bradley at the PGA Championship and though not a major Bill Haas in the Tour Championship; 2012 U.S. Open-Webb Simpson and Ernie Els the Open Championship; 2013 Adam Scott the Masters.